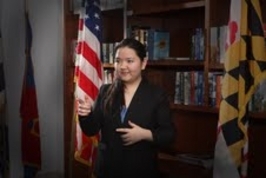 Megan Yan, a high school senior, in the International Baccalaureate® program, at Richard Montgomery High School, Rockville, MD, competed in the American Legion’s High School Oratorical Contest administrated by American Legion Post 295 of Gaithersburg. The purpose of the Legion’s program is to develop a deeper knowledge and appreciation of the Constitution of the United States on the part of high school student. 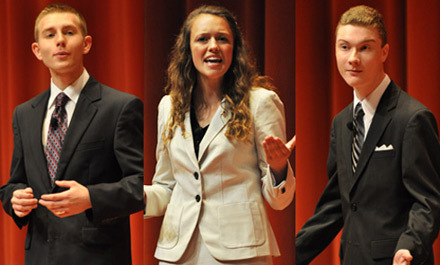 Local contestants present an eight- to 10-minute speech about any aspect of the United States Constitution. Winners receive scholarship money at all levels of the competition from Post County, District and State. The winner of the Department of Maryland competition participates in the national contest’s first round and receives a $1,500 scholarship. National scholarship awards are presented to each of the three finalists in amounts up to $18,000. Megan’s oration led the audience on the journey of struggle the United States endured, led by our Founding Fathers and guided by the Constitution. Speaking on current global events, Megan called to mind new nation’s hope for freedom and the beacon of hope they discover in the Constitution of the United States. Megan will compete again, January 26, 2013, at American Legion Post 171, in Damascus Maryland. There are those who conspire to eliminate freedom from the world today, they are the Wolves. Thanks to Logan Jackonis, a Junior in Poolesville High School’s Global Ecology Program, we have the solution to keep the wolves at bay, The United States Constitution. Thomas Jefferson wrote to Edward Carrington in 1787, "If once the people become inattentive to the public affairs, you and I, and Congress and Assemblies, Judges and Governors, shall all become wolves. It seems to be the law of our general nature, in spite of individual exceptions." He was speaking of the Constitution and the need for the new country to pay attention to their responsibilities thereto. Jackonis participated in the American Legion Maryland High School Oratorical Contest this weekend. He competed against representatives from 3 other Maryland Districts and was judged the winner of the Maryland Contest earning $2500 for college. The next step will be participating in the national contest in Indianapolis. Logan Jackonis reached the state finals by selecting a subject that pertains to some aspect of the U.S. Constitution, with some emphasis on the duties and obligations of citizens to our government. The prepared speeches are eight to 10 minutes long; three- to five-minute speeches on an assigned topic also are part of the contest. The American Legion Oratorical Contest exists to develop deeper knowledge and appreciation for the U.S. Constitution among high school students. Since 1938, the program has presented participants with an academic speaking challenge that teaches important leadership qualities, the history of our nation’s laws, the ability to think and speak clearly, and an understanding of the duties, responsibilities, rights and privileges of American citizenship. The program has featured numerous politicians and prominent contestants over the years, including former president candidate Alan Keyes and CNN anchor Lou Dobbs. Young orators earn some of the most generous college scholarships available to high school students. Over $138,000 in scholarships can be awarded each year. The overall national contest winner gets an $18,000 scholarship. Second place takes home $16,000, and third gets $14,000. Each department (state) winner who is certified into and participates in the national contest’s first round receives a $1,500 scholarship. Those who advance past the first round receive an additional $1,500 scholarship. 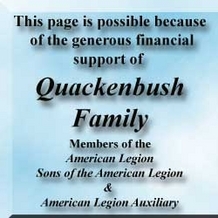 The American Legion’s National Organization awards the scholarships, which can be used at any college or university in the United States. High school students under age 20 are eligible. Competition begins at the post level and advances to a state competition. Legion department representatives certify one winner per state to the national contest, where department winners compete against each other in two speaking rounds. The contest caps off with a final round that decides the three top finishers. Speaking subjects must be on some aspect of the U.S. Constitution, with some emphasis on the duties and obligations of citizens to our government. Speeches are eight to 10 minutes long; three- to five-minute speeches on an assigned topic also are part of the contest. Post 295's Contest is held on the 2nd Saturday in January each year. Students should be preregistered, please use the contact us page.